I am an expat living in Saudi Arabia, I'm planning to visit the UK as a tourist from the 1st Nov to 10th Nov 2016. I would like some help to know what should I do to get the visa? I only want to visit for 10 days and I don't know why I'm getting rejected. I supplied all the documents needed (exit/entry visa, bank statement, flight ticket, hotel reservation, letter from employer on letter head stating all the info needed and granting my back and my passport and ID and photo) is it that I'm using online websites like booking.com and CheapOair for reservations? Should I rely on a travel agency? I was trying to save money by doing so. For my old application, I applied 2 times on different dates before and got rejected. What do I need to do to apply again and get the visa? Is it ok to apply a 3rd time? Below is my first refusal letter, I didn't submit any of the supporting documents, thus the refusal. I had no clue what to submit. I lost my second refusal letter, but I submitted all the needed documents. the reason of refusal was a mismatch in my bank account balance and my application since I used some of the money for hotel reservation and flight ticket. I forgot to mention, in my first application i didn't provide any documents, thus the refusal I got. how can I get help from a registered solicitor? You have entered a tail spin of serial refusals. You have lost the first two refusal notices (that's a bad thing) and have posted a scan of the most recent (that's a good thing). Serial refusals are bad because they feed off themselves and it can be an uphill battle from square 1. Also, it's time to be a little bit careful because if a person is getting serial refusals they have the option (but not the obligation) to lay down a ban under Paragraph 320 or 321.
how can I get help from a registered solicitor? UK Solicitors can develop a practice area accessible by the general public when they are admitted to the UK Law Society. Once they have this qualification, they can be 'instructed' by an individual to help out. The Law Society offers a search engine which is keyed by practice area (obviously you want 'Immigration'). You can select a few and send them some emails and see if they can take you under client care. You will have to agree a fee with one and make a substantial retainer as a prerequisite to instructing them. 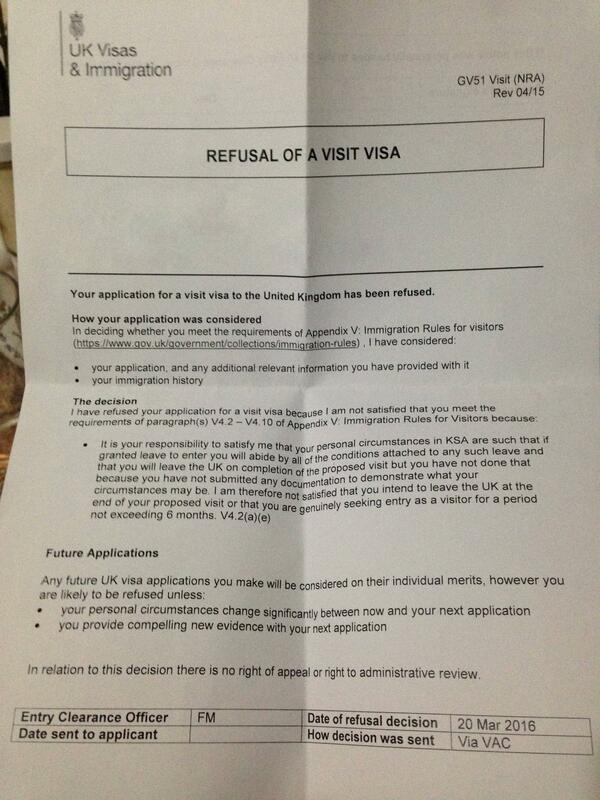 Solicitors do not do pro bono work for visit visas. On the plus side, they will not take you on if they don't think there's a good chance they can win. On the down side, your case is going to be bloody expensive. I am guessing about GBP 3,500 as a stab in the dark, but that's a guess only. Alternatively, the Immigration Services Commissioner can also enable a person to help represent you. These people are called "Immigration Advisers", and the Commissioner has a list of them on her site: Office of the Immigration Services Commissioner. Immigration Advisers do not have the same standards of membership rigour that the Law Society does, and so the risk of taking you under client care is less. They are also less likely to have credible standing with the various ECO's out there to ward off any problems when an ECO is minded to refuse. But they will still want to be paid, and I am guessing in your case the fee would start at about GBP 800, but again that's a guess. Sometimes a practitioner has developed a standing in the profession where they can get approved to join the Immigration Law Practitioners' Association. This association operates a paywall that has all of the latest policy and correspondence with Parliament and the Home Office. They operate a search engine of their members that you can use. Note: the practitioners listed will either be a Law Society member or have a certificate issued by the Commissioner (because those two groups are the only people who can lawfully practice). And finally, if you have a situation that is hugely interesting as a matter of law and the outcome affects a lot of people, you MIGHT be able to get the JCWI to take you on for free. I doubt they will given what you wrote, but there's no harm in trying. Use the Joint Council for the Welfare of Immigrants to post an enquiry. That's four options. I don't recommend using the net because serial refusals are almost too impossibly complex to get all the relevant details. So the best advice is to come to terms with the fact that you will need to pay and then to use the search engine at ILPA. All told there are fewer than perhaps a dozen or two out there with a strong practice area in serial refusals for visitors so you will need to plan for an appropriate amount of time to search. Footnote: Immigration advice in the UK (and EU) is a closely regulated activity. Section 84 of the Immigration Act 1999 makes it a criminal offence to provide immigration advice unless the practitioner is a member of the Law Society or has a certificate from the Commissioner or has an exemption. And they do prosecute. This protects people from being scammed and assures the help they get is high quality. There are counterpart regimes for the Schengen zone and the rest of the EEA. Footnote: Colin Yeo (a barrister, not a solicitor) operates a application checking service where he will look over your stuff and tell you if it's up to scratch. This is a doc checking service and NOT representation (big difference). He charges a flat rate which is a curiously precise GBP 249.99. He's OK. There are some other doc checks out there that can be vouched for also, what they do and what they charge varies. Disclaimer: I have known Colin Yeo (and Ian Westwood) through stakeholder committees for a long, long time. Remember that a doc check will work for border-line cases; it will not work for a seriously complex one (like the one in this question). Not the answer you're looking for? Browse other questions tagged visas uk visa-refusals standard-visitor-visas serial-refusals or ask your own question.